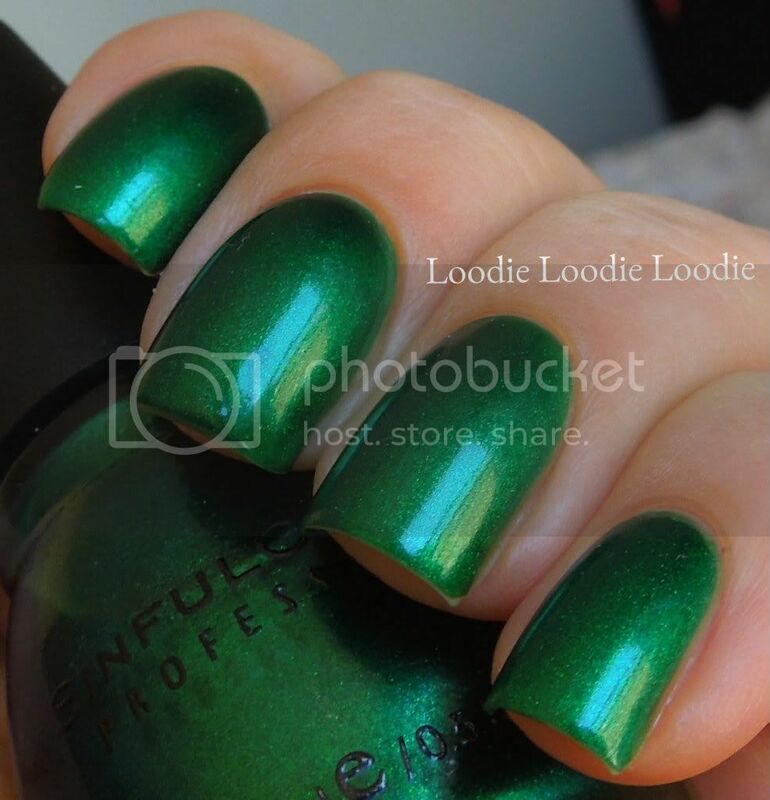 A warm tone deep green with a shimmery jewel type finish. I love this type of finish and want one in every color! I was hoping it would look like the bottle color... sadly the duochrome was not visible on the nail. If you can't tell, I have a nail fix on my middle finger. This will come into play later. 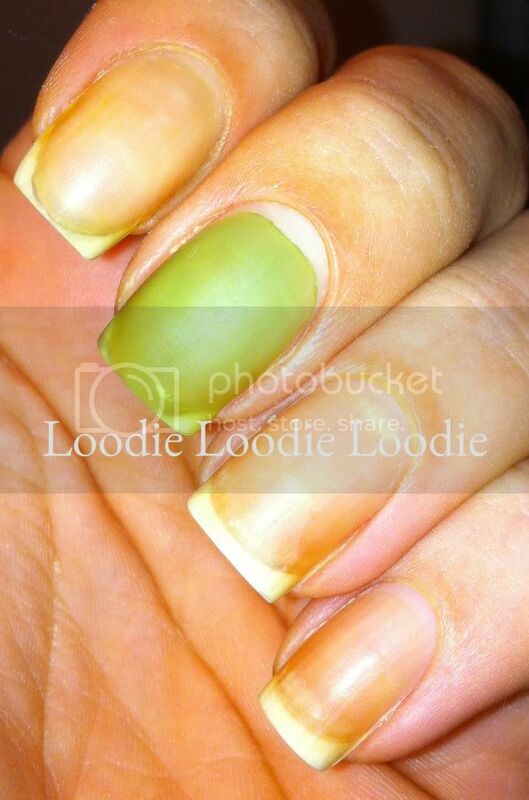 How to for nail fix using Shellac here. But basically, this polish made this happened. Holy freaking jaundice fingers!! 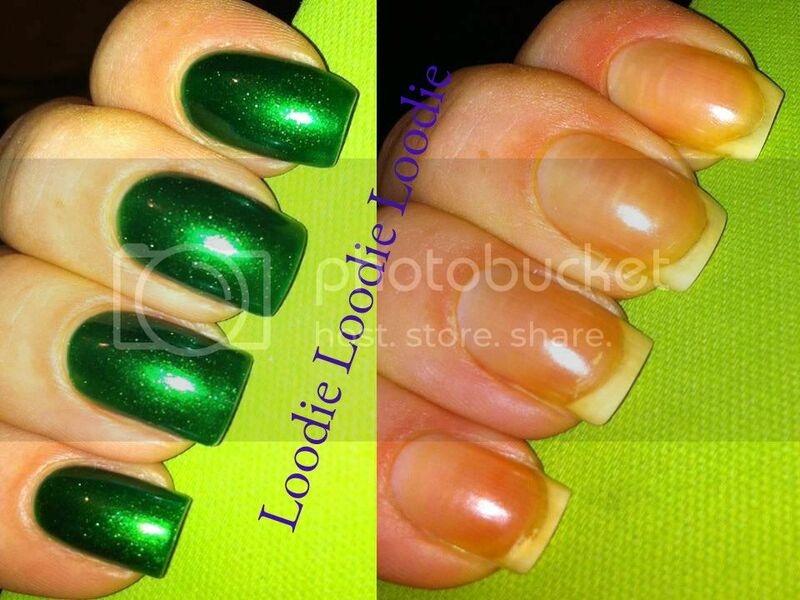 So that nail fix.... it got beat in the face and turned GREEN! On the bright side, the break had already grown out and I could remove it. 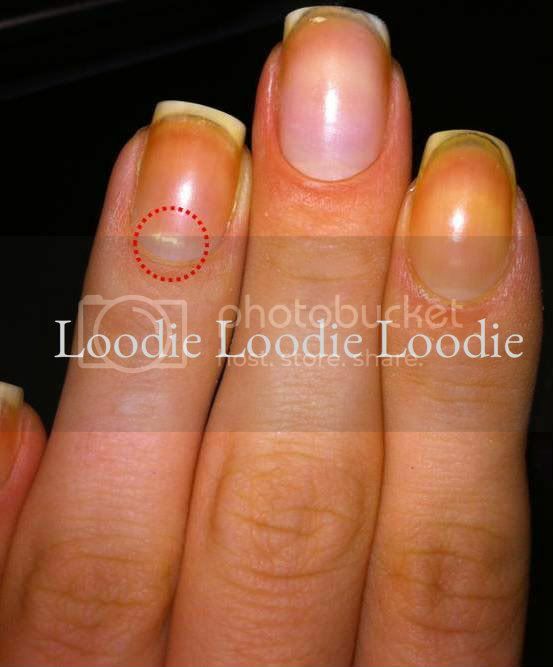 I discovered the nail fix protected the nail from turning yellow! Thanks Shellac! Which is more than I can say for the 2 coats of regular basecoat. Watch out for this beauty! See that white spot I circled in red? There is a reason I have it and I will tell you about it soon. I think San Francisco looks beautiful! Absolutely gorgeous. Luckily, I never had it stain my nails. That said, my nails are always a bit discolored, but I when a polish stains really bad it's hard to miss. What a gorgeous, gorgeous green! Even without any duo shift the shimmer is just incredible. That staining, though...yikes! I'll be sure to double up on base (at least!) if I give this one a try. Wow that polish is GORGEOUS. I've never had a polish stain my nails like that until I wore Zoya's Myrta, which is an orange glassflecky polish. I took it off and my nails were stained super orange. I wonder why some polishes stain and some don't. So weird. The pink china glaze crackle stain my nails like no one else bizznaz! And it know it was the crackle bc I had it over skittles, and my fingers were stained bright pink... However beautiful shade, dispite the staining! That green is stunning! Crazy staining tho! Just like Whitney, I never expereinced staining until I wore Myrta. My nails looked like an orange peel after wearing that, and I only wore it for a day. Thankfully, I am avid reader of your blog (I've read every post!) and managed to buff those babies back to normal! I love this polish but it does the same thing to me, bummer. I am so jealous of your long nail beds! i discovered the same thing recently. sometimes, i do the clear gelish and polish over it to protect my nails. with care, and non-acetone remover, i can change my nail color frequently and not worry about stains. OOOH OOOH I know what that white spot is! And that is one gorgeous green but yuck when you took it off! Sadly, my nails are on strike and won't do anything other than peel and be horrible. Can't wait to see if I'm right for that next post! XOXO! Great post. I've only ever had my nails stained by a polish once. Zoya's Edyta stained my finger nails a putrid gray-green after wearing it. Not pretty. 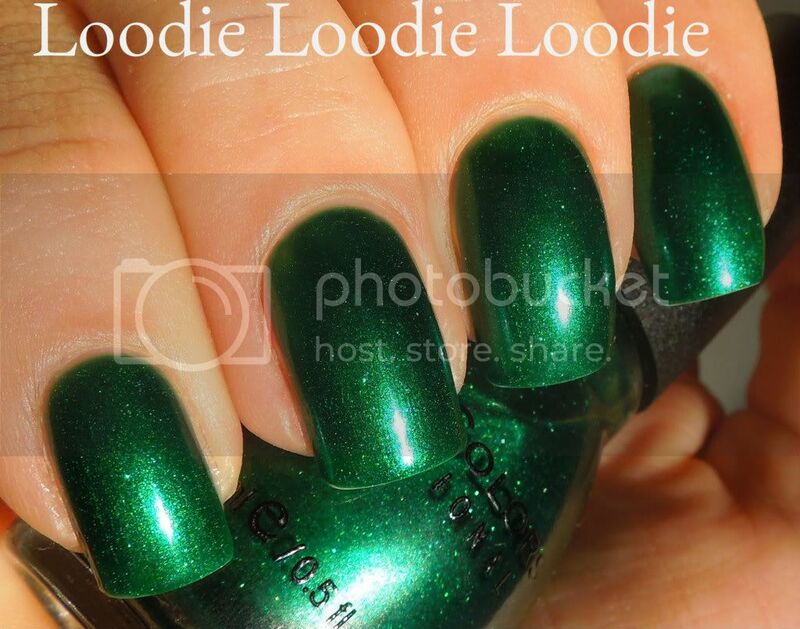 It's a gorgeous gold-green on the nails, and definitely leaves its mark behind when taken off. I wasn't wearing a basecoat when I had it on, so that's probably why. That little white spot on your ring finger happens to my nails all the time. I'm pretty sure I know why that takes place, as I read about it on what I consider to be a legitimate website about dermatological conditions. I won't say what it is, though, because I know you're about to write a post about it. 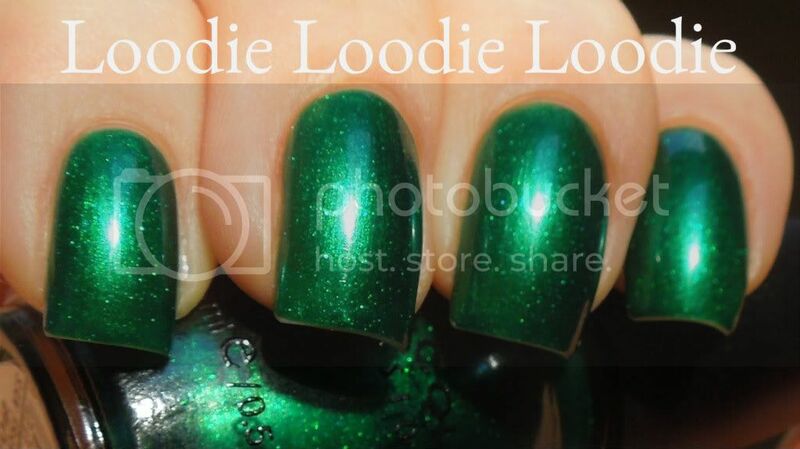 I have this polish and somehow always overlook it. Thank you for bringing to my attention how pretty it really is. I may have to dig it out. 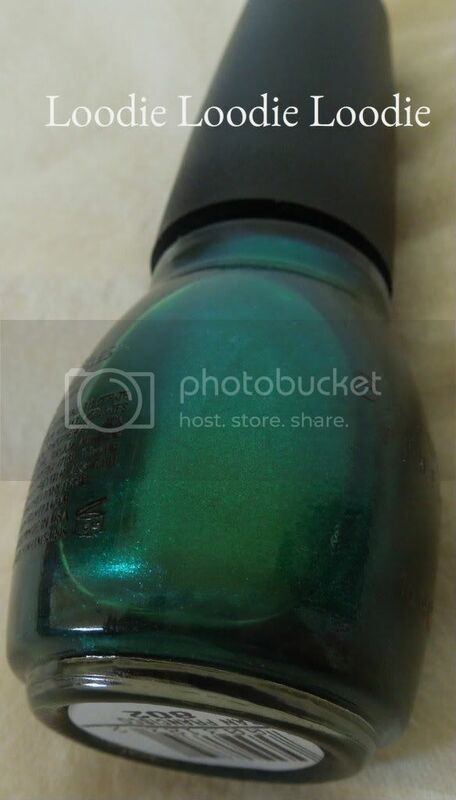 I also have lot of trouble with green polishes staining me. Lovely color, too bad the duotone was lost! I have that same polish. Try this: paint your desired number of coats, but before top coating, swipe each nail carefully with a bit of polish remover on a lint free something. Then topcoat. My theory is that the sparkly bits adhere to the glass with no colored polish between them. Swiping with the polish remover (a less concentrated one might be better here) removes that bit of colored polish allowing the duo tone to show through. Try it, and post if it works for you. 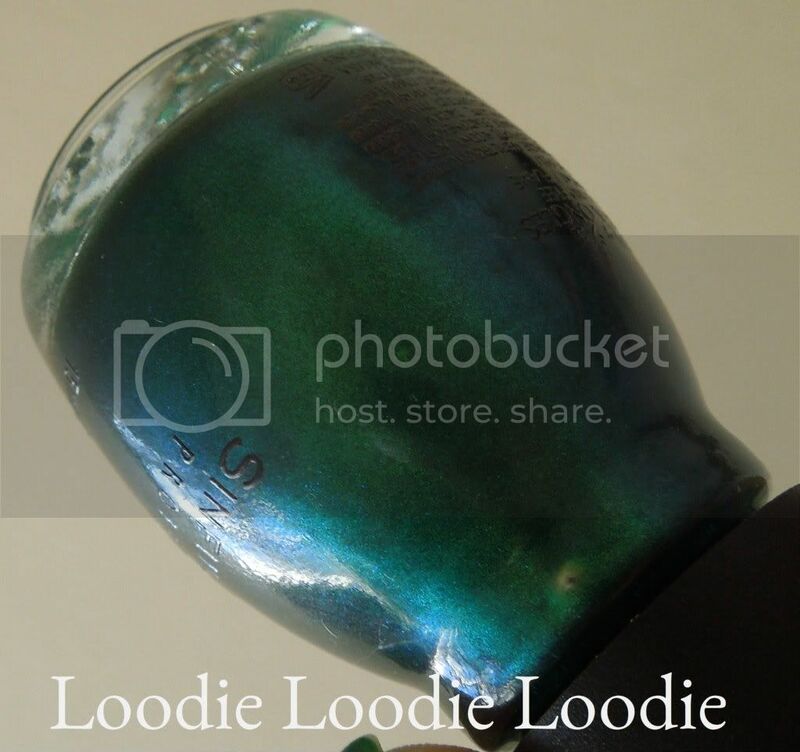 I bought it a couple weeks ago...It's so pretty (no duochrome hues in my bottle anyway), it's such a pity it's a stainer (not that my nails are perfectly white right now :-P).